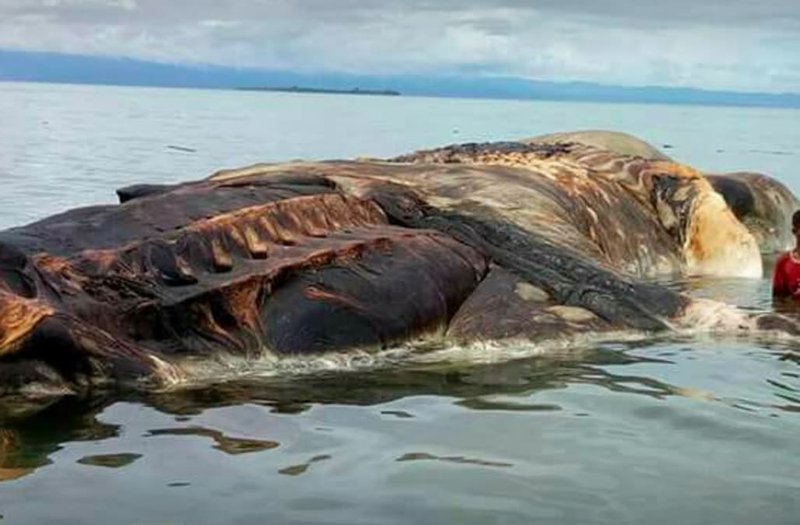 A giant, rotting mystery creature washed up on the shore of an Indonesian island -- and no one can figure out what it is. The nearly 50-foot beast was discovered floating off Hulung Beach, on Seram Island, Indonesia. The Jakarta Globe reports that it was found by 37-year-old Asrul Tuanakota, who initially thought it was a stranded boat. Though photos and videos of the creature went viral, no one can figure out quite what it is. People have speculated that it is a squid or a sperm whale. Giant squid can grow to be 42 feet long and sperm whales are usually 52 feet long. A group of marine scientists are plotting to take samples of the creature soon, Detik reports. Residents have flocked to see the giant creature, which died about three days ago. Some have asked for the carcass to be removed so it doesn't contaminate the area. For now, the local military command is keeping watch over the beast.